In the wake of the biggest corporate tax cut in a generation, there has been no shortage of public relations spin from the Fortune 500 corporations that stand to reap the biggest benefits from the new tax law. From aerospace giant Boeing to retail behemoth Walmart, companies have made prominent pledges to give employees one-time bonuses or even wage boosts, and have attributed them to the tax cuts’ liberating effects. They continue to make these claims even as more sober analyses have indicated these companies are likely to use the lion’s share of these cuts to reward wealthy shareholders. Now, Apple Inc. would like the American public to know that it has “a deep sense of responsibility to give back to our country” a small fraction of its multi-billion-dollar tax cut haul. However, the company’s splashy press release is devoid of any specifics on the jobs it will create as a result of the tax bill. Like other corporate announcements, the company’s recent proclamation of newfound patriotism should be viewed as a public relations ploy designed to convince a skeptical public that working families will see some trickle-down benefit from this historic corporate giveaway. More than any other American corporation, Apple has made a historic gamble on the spinelessness of congressional tax writers. And that bet is paying off in a big way. 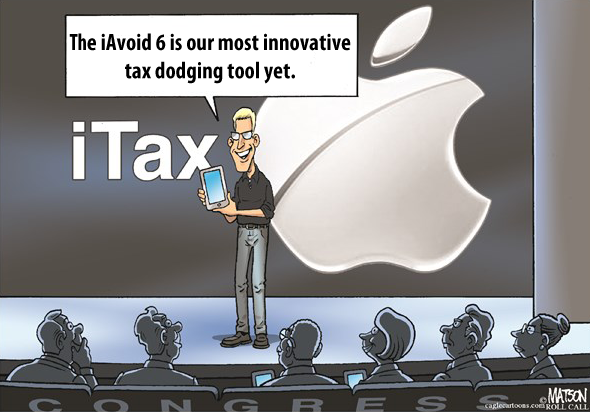 As extensive investigations from the European Commission and the U.S. Senate have shown, Apple has intentionally shifted its profits, on paper, out of the United States and other developed nations and into low-rate tax havens, for the express purpose of avoiding taxes. Hundreds of companies have taken a similar path over the last decade, setting up post-office-box subsidiaries in beach island tax havens and routing billions of dollars to them. Like Apple, these companies gambled that Congress would, as it did in 2004, eventually offer a special low tax rate on these profits. Corporations that have engaged in offshore shell games have been richly rewarded for that gamble by the new tax bill’s deemed repatriation tax break. In the short term, the new tax law grants a “get out of jail half-price” card to the many Fortune 500 corporations that have shifted their past profits out of the United States and into foreign tax havens. Instead of paying the 35 percent tax rate that was applicable to smaller, law-abiding businesses in the past, these tax avoiders can pay a special one-time tax of just 15.5 percent on their offshore cash and just 8 percent on all other accumulated earnings, with no further questions asked. In the long term, companies will reap even larger savings because the new tax law shifts to a territorial tax system in which only corporate profits booked in the United States are subject to U.S. taxes. While hundreds of companies will benefit from this offshore gamble, no one has more skin in the game than Apple. At the end of 2017, the tech titan had $252 billion of cash and equivalents offshore, on which it had paid a tax rate averaging just under 3 percent. This meant that, absent a tax holiday, Apple would have owed $78 billion in U.S. taxes when these profits were repatriated. In this context, Apple’s recent announcement that it will pay $38 billion in taxes on its offshore cash seems less impressive; the correct interpretation is not that the company paid $38 billion but that it avoided an even more impressive sum—$40 billion. Apple’s self-congratulatory press release earlier this week follows in Cook’s disingenuous tradition. Compared to promises made by Boeing and Walmart, the company’s “trickle-down” promises are almost entirely content free, making virtually no commitment to new capital investment or job creation. Instead, Apple focuses on the total amount of wage growth and investment it plans going forward, without giving any indication how much of it (if any) is due to its new tax-cut bonanza. This most plausible interpretation of this virtually commitment-free release is the simplest one: Apple was never going to change its domestic investment plans because of the tax cut. Like other corporations whose executives and shareholders stand to reap immense benefits from the new tax bill, Apple is now promising new capital investments as a consequence of the new tax cuts. But these promises deserve every bit as much skepticism as the tax plan overall, especially when the source is a CEO with a well-earned reputation for saying what just ain’t so.